As you might imagine, quite a bit of media research examines attitudes. While I study the influences on journalists, many people in my field examine the effects of media or, more specifically, how media can change minds. In most media schools, we have plenty of researchers studying political communication, health communication and, of course, how advertising works. Each and every one of those fields is basically, in some way or another, examining persuasion. In other words, many folks who work with me study how to change people’s minds. 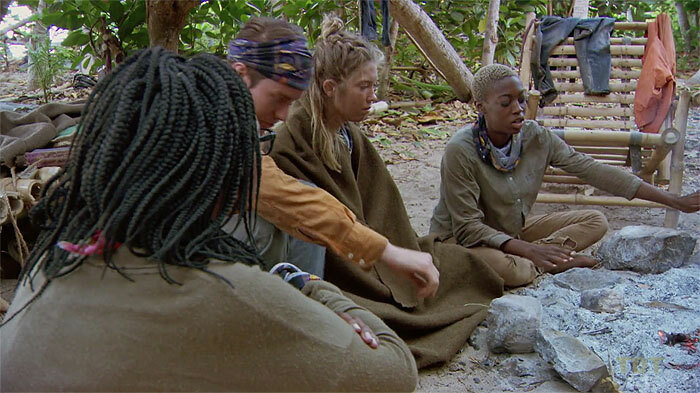 If you think about it, throughout the game of Survivor, castaways are always trying to change people’s minds. Sometimes, you can see results in both the short term and long term. And sometimes that cognitive persuasion leads to a change in behavior. And that’s primarily what persuasion scholars study. Oh sure, for example, folks who research advertising see how advertisements might change someone’s attitude about brands, but they really want to see how to change behavior: Will this Pizza Hut ad make people order Pizza Hut instead of Domino's? These are empirical questions. That’s what Des tried to accomplish this week: She not only wanted to change the minds of the remaining Malolos, she wanted to catalyze action. And that’s where the elaboration likelihood model comes in. Authored by social psychologist Richard Petty and the late neuroscientist/psychologist John Cacioppo, ELM fundamentally examines how to change attitudes. The theory posits there are two routes to attitude change in the brain: the central and the peripheral. Essentially, the central route that leads to attitude change comes after someone explicitly thinks about evidence, spends some time pondering and then makes a decision. This type of attitude change is strong and it’s hard to change someone’s mind. Effectively, these are strongly held beliefs. The peripheral route leads to less-lasting change and messages that travel this route to the brain tend to be judged – or elaborated – less on the soundness of the message, but on a less important and, often, implicit cues. For example, if I’m very interested in a subject – if I have a strong need for cognition – I might read an article or many messages, think long and hard about them and then form an attitude. These messages travel the central route. I’m thinking about cues; they’re explicit and I’ve elaborated on them for a while. However, the less likely I am to care about something – the less need for cognition I have on a subject – the more peripheral cues matter. Messages that travel the peripheral route can change someone’s attitude, but this change tends to be short-lived. This route is easier for message senders to manipulate, though. But here comes the problem with Survivor: Essentially every single vote-off is thought about for a long period of time by every player. So, these messages must travel the central route. We saw this play out this week when Des tried to change Laurel’s mind and, subsequently, voting behavior. Interviews showed us Laurel thinking long and hard about what to do. As far as we could tell, she didn’t spill the plan to Dom until the next day. But Des did not provide enough incentives to change Laurel’s already deep-seated attitudes about who she wanted to work with for the game. I’m assuming her knowledge about idols helped there too. 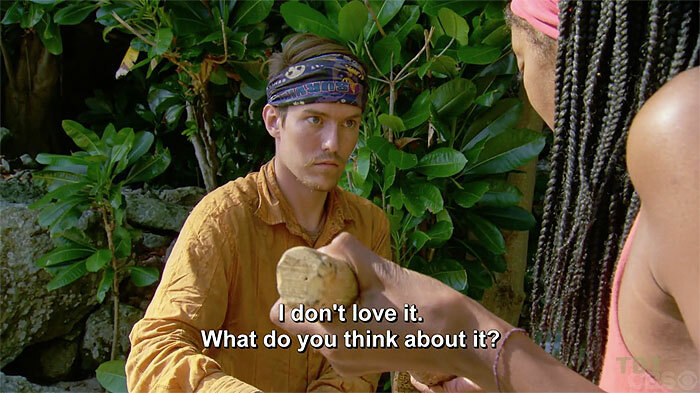 And that’s why on Survivor, so often we viewers yell at the television for someone to make a damn move and it never happens. As a Laurel supporter, I’m sure I’m going to do this a lot in the coming weeks. She needs to make a move against Dom and Wendell to win, but her attitudes are pretty entrenched right now, and anybody trying to change her mind will have to do so with messages traveling the central route, which means lots of elaboration, which means less likelihood of attitude change. Make sense? These cognitive theories are always a little hard to understand at first, but, really, I could probably apply ELM and similar theories each and every week. Jenna: Last week, previews clearly foreshadowed Des’ attempted moves. This week, less explicitly, it looks like it might be Jenna’s turn. I don’t buy it. Since there is a double elimination coming, I’m betting Jenna and Chelsea say goodbye this week. Angela: With that said, Angela could be headed home this week. But, I have a feeling she sticks around as a pawn for a bit longer. As TDT fearless leader Jeff mentioned this week, this season is turning way too predictable in terms of guessing who at least makes the finale. Sebastian: I saw very little of Sebastian this week. Presumably he found of stash of weed somewhere on the island. 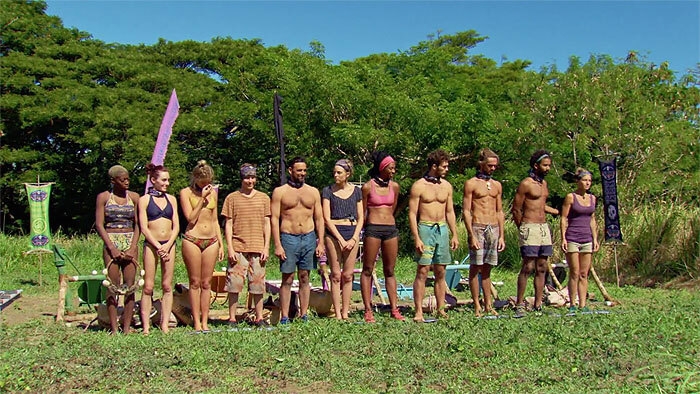 Seriously, I picture every other castaway sneaking off and looking for idols while SeaBass sneaks off to find pot. Chelsea: So was Chelsea willing to vote with Des this week or not? This is the big problem of the season: The editing is doing a crap job of keeping us even a tiny bit informed of most votes. Obviously, we can’t be told everything so there is some surprise at tribal, but we’re basically left in the complete dark this season. It really stinks. And keeps us from forming any bonds with players like Chelsea or Angela. Donathan: For the last couple weeks, we’ve seen Donathan on the fence about where his loyalties lie, but now he’s got an idol so maybe he’ll feel more comfortable making a Big Move™. The problem? Everyone knows he’s got the idol and he’s running out of pawns to use. Domenick: In one of her exit interviews this week, Des described Domenick as the guy everyone knows is untrustworthy, yet everyone trusts. I think we’ve seen that play out all season long. It’s amazing that people trust the dude, but the longer this season goes, the more I start to believe he could actually win. Michael: I want to reiterate what I wrote last week: Michael is an amazingly good player for an 18-year-old dude, but, man, I wish he looked like he was actually fun out there. I’ve never seen such a boring teenager. And I teach teenagers. Laurel: My Winner Pick™! She’s still in the game and playing the role of the fulcrum. While I am just super happy that I still have a small chance to actually predict a winner, the way Laurel is playing right now makes me think she can’t win. Oh sure, she’s playing an important role in the game, but she’s consistently deferring to Dom and Wendell and that certainly won’t play well to the jury. Kellyn: You have to wonder if now that someone made a move against Kellyn, others will start to notice how well she’s playing? Either way, editing this week sure doesn’t give me much hope for a Kellyn victory. Wendell: The one question I keep coming back to: If both Dom and Wendell make the end, will Wendell be penalized for not being as showy as Dom? I think a lot will come down to how each utilizes their idols. OK, usually I’m completely against a two-elimination episode, but this season is starting to be a real post-merge bore. Let’s get some of these unseen players out and talk again next week.